On the weekend of Oct. 17, the best teenage pageant contestants in New Jersey gathered in Parsippany to compete for Miss New Jersey Teen USA. The field was narrowed from 75 contestants on Friday to five on Sunday. For the second straight year, Cherry Hill resident Lauren O’Brien was standing on stage at the end as one of the competition’s finalists. O’Brien, 17, was named the second runner-up in the Miss New Jersey Teen USA pageant. It was the second consecutive year O’Brien finished in that place. 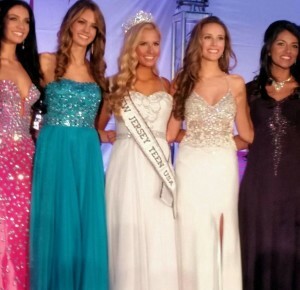 Miss New Jersey Teen USA is a weekend-long event open to teenage girls ages 13 to 18. Each participant goes through an interview and is judged in swimsuit and evening gown competitions. After the top five are selected, they are asked a final on-stage question before the winner is selected. Participating in Miss New Jersey Teen USA was something O’Brien always dreamed of because she enjoyed watching beauty pageants as a child. In her first competition in 2012, O’Brien did not qualify for the finals. However, having one year of experience under her belt helped prepare her for the following years. O’Brien has found a way to be successful in the pageant without having professional help. She has not worked with a coach, and she does her own hair and makeup for the event. O’Brien’s success can instead be traced to her own interests and hobbies. For the interview portion, contestants are asked to talk about current events, something O’Brien enjoys. A junior at Bishop Eustace Prep, O’Brien is a member of the National Honor Society and enjoys many of her classes. Her performance in the interview was impressive enough to earn her an award in her first year of competition at the age of 14. The other aspect of the competition is the swimsuit and evening gown segments. O’Brien said having a proper walk is crucial to being successful in those events. After her first year of competition, she was able to greatly improve. “It was easy to use the video from the year before to figure out the things I need to change,” she said. O’Brien also benefits from some real-world modeling experience. She occasionally travels to New York City to model for Seventeen magazine. The experience with Seventeen has helped O’Brien succeed in the swimsuit and evening gown portions of the pageant. This year’s competition was the second in a row where O’Brien advanced to the finals. Despite not winning the title of Miss New Jersey Teen USA and advancing to the national competition, she is very proud of her accomplishments. Next year, O’Brien will compete one more time before heading off to college. She intends to work harder than ever to become Miss New Jersey Teen USA. “I think that next year, I’m going to work on myself as a whole package and get a coach to help me get some insight,” O’Brien said.